The CANopen Master/Slave Stack of emtas is a software library that provides all communication services according to the CANopen communication profile CiA 301 V4.2. The stack is developed in ANSI-C. CANopen-compliant devices can be quickly and easily developed or extended with our CANopen Software. Besides the standard services, extensions for additional communication profiles such as redundant communication (CiA 302), safety relevant communication (CiA 304) as well as various device profile implementations are available. Currently the following profile are supported by separate extensions: 401, 402, 404, 406, 413, 418, 419, 437, 443, 447, 454. To save resources the CANopen stack is widely configurable and scalable. The settings for these features are supported by the graphical configuration tool, CANopen DeviceDesigner, which also allows the creation of the object directory using a built-in database. As a consequence, changes can be realized fast and easy. Many ready-to-run examples are provided to make the start with the CANopen stack as easy as possible. Additionally a user manual, which describes principles and use cases and a reference manual, which describes each API function in detail belongs to the scope of delivery. The stack is constantly tested with the CANopen Conformance Test for compliance with the specification. Additionally CANopen FD and the USDO service is already supported according to the current state of the specification. A CANopen Manager stack with all communication services according to communication profile CiA 301, v4.2 and manager features according to CiA 302-2. The CANopen DeviceDesigner is an easy-to-use tool for fast and cost-saving design of CANopen devices. With a few mouse clicks the object dictionary of the device can be created on the basis of predefined profiles. 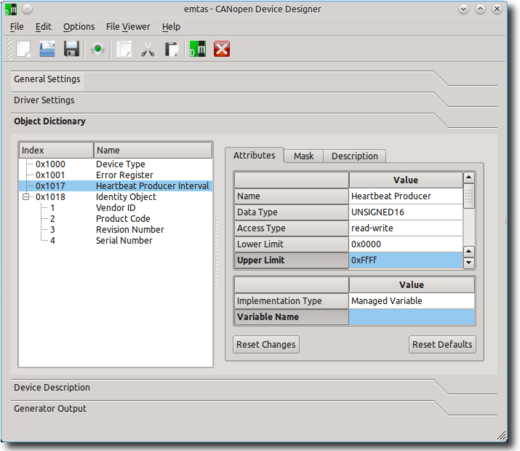 The CANopen DeviceDesigner creates the object dictionary and initializing functions in C, the electronic data sheet in EDS and XDD format and a device documentation. Additionally the CANopen DeviceDesigner configures the CANopen stack and CANopen driver under consideration of the device characteristics. A single-user license of the CANopen DeviceDesigners is always included with our CANopen Stacks. An increasing number of CANopen devices need bootloaders to update the firmware in the field. To meet these demands emtas developed a new bootloader that needs only few memory resources. The bootloader supports the necessary services (SDO, NMT slave, heartbeat producer) and objects. So resource saving 6 to 8 KiB of flash memory are sufficient for the emtas bootloader – and it is still CANopen compatible. The bootloader is available for different 16- and 32-bit microcontrollers and can easily be adapted to other targets.